Ten vital questions: To what extent can doctors play God and give last rites to the brain dead by ripping their body parts?FIRST THE SAD FACTS: Twenty four year old Jeewanthi Alwis, the mother of a child, attended a wedding of a family friend with her husband last Saturday night, the 27th of January. On their way home they met with an accident. Her husband died on the spot. With the benefit of hindsight, it can be safely presumed, he was the lucky half to have succumbed to his injuries instantaneously, to have made a quick exit. His wife Jeewanthi was not that fortunate. Though she survived the initial crash, horrors worse than an instant death awaited her. The accident happened in Paddukka. She was rushed to the Homagama Base Hospital. There the doctors on duty that night determined that she had suffered serious injuries to her head. Instead of treating her there, they decided instead to transfer her to the Accident Ward at the Colombo’s National Hospital where better facilities were available to treat her. The distance approximately 20 kilometers. The time of travel approximately 45 minutes. When she was brought there the doctors decided that she may not recover from her serious head injuries and sent her back to the Homagama Base Hospital. THE FIRST QUESTION: Why? Why was it necessary to transport her 23 kilometres away to a base hospital when she was already lodged in the nation’s main general hospital with all the facilities at their command to treat her? If there was hope to revive her, the hope lay nowhere else but in its ward. In normal circumstances, patients in serious condition are transferred to the main hospital for better treatment. In Jeevanthi’s case it was the other way round. In her case, it was double jeopardy. Like passing the parcel played at children’s birthday parties, she was first passed from the Homagama Base Hospital to the National Hospital which passed her back to the Homagama Base Hospital. She was removed from the main hospital to a lower B grade hospital. Why? At the Homagama base hospital, a team of doctors tried their best, it is said, to revive her from her coma but apparently had failed. The medical team emerged from the Intensive Care Unit to gravely inform the grief striken distraught family the bad news. To announce to them that, in their opinion, she was brain dead; and nothing could be done to bring her back to life. 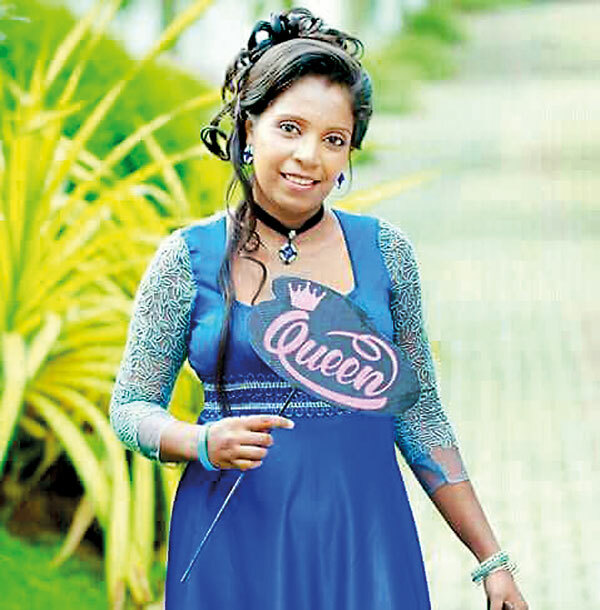 THE SECOND QUESTION: Was this failure to resuscitate her brain due to the decision of the doctors at the five star hospital of Lanka, the main general hospital of the country, the National Hospital, to pack her back to the same base hospital in Homagama which had sent her there, nearly an hour’s drive away? Did lack of medical attention during that one vital hour, turn her comatose condition to one that had passed beyond the pale of revival? THE THIRD QUESTION: Did those doctors request the family’s consent to switch the life supporting machine off as would have been the case in normal circumstances? No. Instead they wanted to keep it on for another six hours or more and keep Jeewanthi alive. For what possible reason? Not to make a last ditch attempt to revive her from her moribund state, but purely to perform a five hour operation on her to remove her organs whilst still alive. THE FOURTH QUESTION: Only a thin live divides the sublime from the ridiculous. The genius from the lunatic. The brain dead from the comatose. The human brain is like the Amazonian jungle. A vast tract of unexplored virgin terrain still to be discovered. Still to be unearthed. No scientist alive will dare to presume he holds the key to unlock its secrets or to reveal its infinite range and power? Does the soul sleep in the brain or does it slumber wide awake in the heart? These are subjects which the sages of old had dwelt upon at length and on which even the Buddha remained silent when once asked: Where does the soul find home in the human anatomy? No matter the concept of soul and no soul, no matter whether ’tis immortal or subject to change, where does it truly lie, in the brain or in the heart? THE FIFTH QUESTION: In the light of the above, can a Homagama Base hospital surgeon then come forth to declare that though the heart still beats, all life has fled from the body of one he arbitrarily declares to be brain dead? Could any surgeon have truly vouched that though the brain be dead, that whilst the heart still beats, whether on a life supporting machine or no, that all sensations of pain and suffering had ceased to exist in Jeevanthi’s mortal corpus? And that such a seeming lifeless, helpless body, though to the world she appeared dead as dead can be, though in the blinkered eyes of doctors she was condemned as dead beyond hope, was fair game to be artificially kept alive for the singular purpose of extracting from Jeewanthi inert body, vital organs to sate the professional macabre cravings of those with a bizarre shopping list for body parts? THE SIXTH QUESTION: Was Jeewanthi condemned brain dead and, though medically considered as dead as a door nail, still kept alive for the sole purpose of removing her organs, one by one, even as vehicles are condemned as not being road worthy and cannibalized thereafter for its spare parts to be sold at some Panchikawatte motor shop? THE SEVENTH QUESTION: Jeevanthi’s two kidneys, her two lungs, her two eyes, her heart, her liver, her skin tissue, the bones of her legs were removed in the five hour operation whilst she was still technically alive. That itself is a shocker that must chill the rest to the bones, considering what may happen to one if doctors declare one’s brain is dead, though the heart still pumps and is still alive and kicking. And use the ‘brain dead’ diagnosis as a valid license to maul one’s body by scavenging upon one’s vital organs. Like Catholic priests giving the last rights to the sick on their death bed to uplift their souls, is this the new fangled trend of doctors to give last rites to the brain dead with a vulturistic eye on ripping their body parts? But who gave this team of doctors’ permission to do it? It is reported that they obtained the consent of Jeevanthi’s father. But does that suffice? Is it not the case that no organ, not even the cornea of the eye can be removed from a dead person if prior consent of the deceased had not been expressed in writing before his or her death? Not even the father, nor the mother, no son or daughter can give their consent to even medical ghouls to thieve the assets of their beloved dead in the absence of written consent of t a person before his or her death? THE EIGHTH QUESTION: Who decides whether a person is brain dead or only in a coma? It is the doctor, is it not? And when he makes his decision, for whatever reason, whether motivated by money or selfless ambition to conduct experiments in the name of advancing the boundaries of medical knowledge even as the Nazi sadistic doctor Dr. Josef Mengele used it as his excuse when he, in the name of science, conducted experiments on pregnant Jewish women in Auschwitz’s concentration camps before sending them back to the gas chamber, who is there to say no, you are wrong doctor, you are mistaken? At that moment in time, when a man with a stethoscope casually strung around his neck and a scalpel in his hands decides to play God, do the poor have any option but to believe in his divinity,? To question a doctor’s judgment amount to sheer blasphemy? Not for one to be burnt at the stake. But for one’s loved one to be killed on the operating table? Would Jeevanthi’s parents, had they been rich and powerful, agreed to their supposedly brain dead daughter being subjected to a five hour operation whilst her heart still throbbed, albeit on a life support machine, or would they have instead said no to give their consents to the doctors request and opted instead to give her a decent exit. Did Jeevanthi’s father have such a choice? Or was the distraught father, subjected to undue influence to give his consent to allow the doctors to do as they pleased? THE NINTH QUESTION: When a doctor comes out of the ICU and tells the patient’s family their child is brain dead, what possible measures exit for a father without means to consult a second opinion in a government hospital? And if the doctors further say to the father in that grief stricken hour, now that your child is beyond return, why not remove her organs as well and fix it on another, for at least it will be a meritorious act that will ensure your child a better rebirth? To recap Jeevanthi’s brief life and tragedy: She was only 24. A young mother of a single child. She had met with an accident after attending a wedding of a family friend. Her husband had died on the spot. She had survived the accident, though with serious injuries to her brain. She had been taken to the country’s main hospital where the doctors thereat had opined that he had suffered serious injuries to her head. But instead of treating her then and there, they had opted to send her back to a base hospital 20 km away, an hour’s drive away. The doctors had informed her father she was brain dead. And asked his permission not to simply switch the life support machine off but to keep it on for six hours and more to perform an operation on her to remove her organs whilst still alive. The Homagama Base Hospital team proudly proclaimed it as the first successful organ transplant that had been performed in the hospital’s 70 years of existence, Good for them. And all salute and cheer. But wonder what 24 yarer old Jeewanthi would have thought and felt to have been used as a guinea pig and to be vivisected thus to enable others to celebrate their achievement without a word of her sacrifice. THE TENTH QUESTION: Haven’t you heard or read of near death experiences, related by people who had been once condemned as brain dead? Or to put it in another way: Doesn’t anyone believe in miracles anymore? Will the bud from the mud be nipped in its first bloom?‘Pohottuwa’ will be the biggest loser if election victory hopes are dashedWhat has for years been a contest to decide who best can clean the drains and sewage, who best can rid a town’s tons of garbage, who best can light the streets’ lamp posts and best deliver a community’s demands and service its needs, has suddenly turned from a genial, genteel, urbane affair to elect city fathers and mothers, into a gigantic life or death war between titans battling for Lanka’s throne. 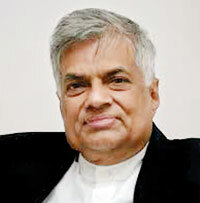 One whose outcome may well portend the downfall of the Government in the years to come; foreshadow the breakdown due to irreconcilable differences of the SLFP-UNP union of convenience; and ring the death knell to the lotus hopes of Rajapaksa’s faction, the Sri Lanka Podujana Peramuna, as it faces its baptism of fire. But whatever the outcome of this local government election, you can bet your bottom buck that both the two major parties, the UNP and the SLFP, even if they lose, will survive the holocaust; and will live to rise again to fight another day. But can the same be said of the SLPP, the G.L. 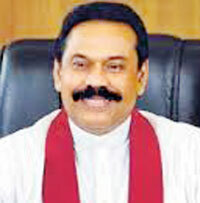 Peiris front for Mahinda’s third advent? Can one dare to place the new Central Bank 1000 buck note issued this week to commemorate Lanka’s 70th year of independence, on a wager that the Rajapaksa party will have an afterlife to speak of should it die in battle on February 10? Thus would it not have been with some trepidation, some iota of lurking doubt that Prof. Peiris, chairman of the SLFP breakaway faction, the Sri Lanka Podujana Peramuna, the SLPP, and its ghost leader and chief sponsor Mahinda Rajapaksa would have awoken this Sunday morn wrapped in the quilt of fear that they may be proved wrong in their proud boast they have the people’s backing, come this Friday when their swank and swagger is put to the test? For all their wild bragging, for all their bravura performances on the nation’s stage to brainwash the collective psyche that the masses are still with them; for all their pompous claims made not even a month after Rajapaksa lost to Sirisena in the 2015 January presidential election, that whatever the poll results determined that eventful January day, the masses were then and still are solid in their support for the former Rajapaksa regime and crave the return of Mahinda R to rule the roost, assume the throne once more, at the helm of political power, what will be their future were the people’s verdict to rule otherwise? That the fantasy bubble — the balloon of hope they have blown so big with much hot air — will burst should the people prick it with the pin of their ballot and prove them all wrong? That their party’s symbol — the lotus bud — will only rise from the mud to expose its presence above the watermark, each and every one of its thousand white petalled lips splattered with the self same mire from which it rose, with its core rotten black, only to wilt and droop in the Yahapalana sun and fall to the muddy origins from whence it was born? Though the bets are heavily placed on the UNP as odds on favourite to steal a gallop to the post over its rivals — even though it is handicapped, encumbered as it is with the bond scam dead weight — the spectators’ binocs should be firmly fixed and focused on the two stallions running in this greyhound race exalted to the level of a Royal Ascot, gasping for air in the final furlong to outdo each other and win a respectable second position to gain a credible outing in the all important 2020 Derby to follow. In this three cornered battle, the fight to the death is not between Ranil, Maithripala and Mahinda. The battle is for second place. Between Sirisena and Rajapaksa. 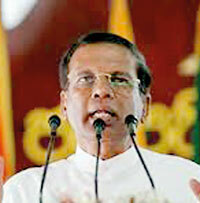 A war between Sirisena’s belief in just governance which is steadfast in spirit but slow in implementation for it takes not only him but the masses from every strata of society to abide by the faith uphold it faithfully and Mahinda’s conviction in his own Chinthanaya which is swift and final which needs naught but himself to implement without any divergence of opinion as the best course for Lanka. That enabled him to claim he reunited Lanka’s North with the rest of the country only to end up giving the Chinese a foothold on Lankan soil by creating an appendix of land on Colombo’s shores. It’s not that the people have lost their faith in democracy. They demonstrated their commitment to its ideals when they voted for Sirisena three years ago for his vision to dawn a new era based upon the precepts of democracy, called by another name, namely, Yahapalanaya. The worrying factor is the people’s short term memory. The hard disk is solid. But the RAM can crash overnight. Especially DRAM, Dynamic Random Access Memory, which demands the memory must be constantly refreshed or it will lose its contents. Or in other words, will the fears of the past be turned to future tears should the ogre at the gates storm Sirisena’s Yahapalana citadel and take the whole nation hostage? Sirisena and Rajapaksa know the knackers’ yard awaits them both if they lose to win second place in their sprint to the finishing line. Should Rajapaksa win over Sirisena, Sirisena’s dream of being president for a second term will be over. If Rajapaksa were to lose, his claim to possess the charismatic right to the love of the people and thus declare his divine right to the throne of Lanka will end with his fantasy and die with his dream? It would not matter much to the nation if the UNP won or lost and surrendered supreme place to Sirisena’s SLFP at the local government election this coming Saturday. Life will go on as usual. You’ll hardly notice the difference. A coconut may be a hundred bucks, but precious liberties, the right to life itself, will remain safeguarded, even as it has been for the last three years. And though strikes, especially the doctors’ strike over SAITM, have served to cripple the nation’s forward march, the Government has not deemed it fit to make the ‘white van’ fleet an essential service to quell the dissent. But on this 10th, if Maithripala gets steamrolled and lies flattened under Mahinda’s merciless destructive juggernaut, think what a world of difference it will make to the nation. What it would mean to this nation’s future and how it will shake the shattered pillars of democracy which the coalition government have only just begun to restore from scratch, if the people were to shout ‘open sesame’ to Ali Baba’s cave of countless thieves and set them free to enjoy their ill gotten wealth? Think before you vote. It’s not for better drains or brighter city lights. Not for better sewage disposal or better garbage collection. But for a better lifestyle that guarantees your right to breathe the ozone air of fundamental freedoms. The right to life itself. For, after all, man does not live by bread alone. But has often died a countless deaths under the jackboot of tyranny in his cowardly quest for a piece of rich cake to stock and fatten his belly rather than seek rich fulfillment in replenishing his larder of self respect.